A fun game to play with a partner to develop reading and spelling of CVC, CVVC and CCVC words. 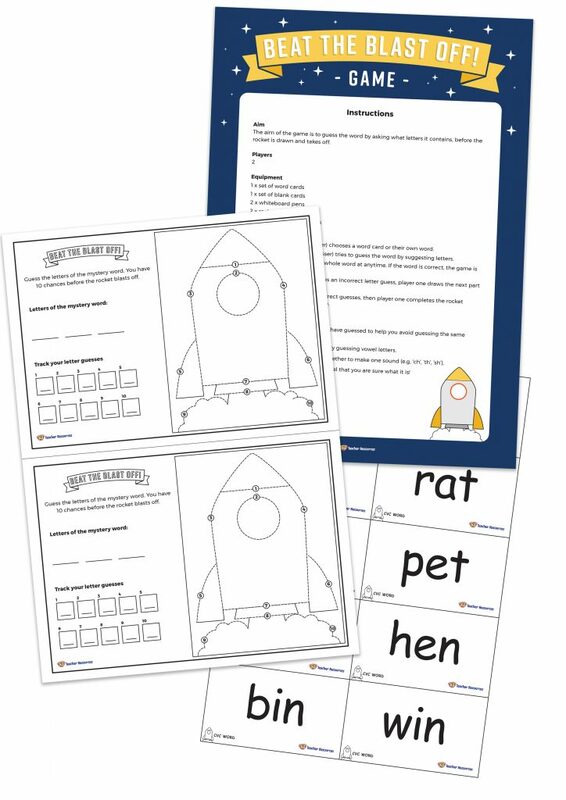 Ideal to use in the classroom as a whole class or small group activity when learning how to read and spell CVC, CVVC and CCVC words. Select and download the required font. Select the gameboard and game cards most suitable for the needs of your class. Print and laminate multiple sets of the pages required, (enough for the whole class or a small group of children). Read the explain the instructions. Arrange children into pairs and provide each pair with 2 x gameboards, 2x whiteboard pens and a set of word cards. Ask the children to work with a partner to take it in turns to be the cardholder and the person who guesses the letters of the word. Monitor and support the children as they play the game.